So, Agri stocks offer relatively uncorrelated exposure (on an underlying basis) to pretty favourable secular growth (and emerging/frontier market) trends. 🙂 What’s not to like?! Well, like any great/compelling investment theme, there’s two key challenges/risks – we need to find stocks that genuinely offer the desired exposure, and then we need to avoid over-paying! [Then, of course, there’s the risk of hucksters/con-men who’ll utilize any viable investment theme to try strip you bare. And agri investments really seem to have a fatal attraction for gullible investors… Ostrich farming, exotic farmland, forestry, bamboo plantations, etc. – the list keeps expanding, and we’re just seeing the tip of the iceberg here. I expect ‘opportunities‘ will expand exponentially as promoters exploit people’s fear of actual/expected inflation. Anyway, I’ve become a lot better with the first challenge, but avoiding paying up for theme stocks is a far tougher challenge. I’ve learned over the years that buying cheap doesn’t necessarily work, buying growth (at any price) certainly doesn’t work, it’s got to be buy growth at a cheap price! If you exercise the necessary patience, another slump always comes along & then you can take full advantage. After all, if we’re talking about investing in some compelling decade(s)-long trend, what the hell’s wrong with missing out on a year or two? Yeah yeah, I know, impatience is a terrible beast! 😉 But I swear, much of my success these days in stocks is down to not buying – if you know what I mean! I look through my portfolio, and blog write-ups, and see so many stocks I’ve tracked daily & weekly for (literally) years before finally pulling the trigger at the right time & price. Closed-End Funds/Investment Companies: There are a number of cheap & attractive funds listed in London. They’re all quite specialized, however, and maybe not the first/best port of call I’d suggest for an investor building exposure. I do hope to write more about some of these in future posts. In fact, off the top of my head, I really can’t think of any closed-end fund that offers an investor general/diversified agri exposure. Therefore, I think we can quickly move on to Exchange Traded Funds (ETFs). I guess I should more correctly say Exchange Traded Products (ETPs), as there are some crucial differences in funds. I’ll focus exclusively on US ETFs, as they mostly have the larger market caps & have been around that much longer – but note UK/European ETFs are v similar. – We’re just offering a useful product, you don’t have to buy it! – Didn’t you read the dozen pages of fine-print boiler-plate risk disclosure we included in the prospectus? The first three responses are part & parcel of the new ‘ethical‘ landscape we’re all being subjected to, but personally I find the fourth is the most pernicious. In fact, it pretty much deters me from investing in any open or closed-end US funds these days. I mean, have you tried to read a goddamned US fund report recently? Christ on a f**king cross – most of their disclosure’s useless and/or unreadable, their commentary’s anorexic & boiler-plate, and you’ve virtually zero chance of ever reading any decent stock analysis, or market outlook. Shame on all concerned! Compare that to the joy of reading a decent UK investment trust annual report – or, even better, a Swedish report – go on, try one, they’re v tasty! Physical ETFs: Actually, these aren’t such a bad idea! Oh Lord, have I just fallen in with the paranoid nutter crew..! They’ve really got some odd ideas (& a strange obsession with JP Morgan (JPM:US)). But it’s relatively easy to identify the storage/expenses involved, so you can expect these ETFs will actually track spot prices, minus a predictable expense drag. This works really nicely with (precious) metals, but unfortunately it’s not so easy with soft commodities! In fact, I’m not sure if a provider has even attempted this? I just read a Barron’s prediction re surging global milk prices – anybody fancy a milk lake ETF?! Seeds & Pesticides (22%): Monsanto & Syngenta. These are the ‘big pharma‘ of the agri world, but they’re priced v differently! Every time I look at them, I like their intellectual property, their business model & their prospects – and then reluctantly decide they’re just too expensive, and move on… Today, it’s the same story: They’re priced at an average 21.6 P/E, and a 3.0 P/S ratio. Too rich for my blood..! 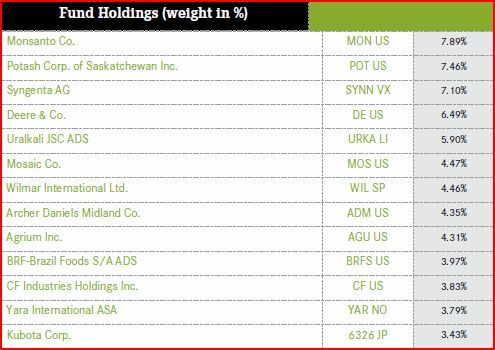 Fertilisers (44%): Potash, Uralkali, Mosaic, Agrium, CF Industries & Yara. This sector’s traditionally a lot cheaper, with a current average P/E of 10.9 & a 2.7 P/S ratio. Interestingly, Yara‘s the only stock that’s consistently caught my eye – what luck, it’s also the cheapest, with a 6.4 P/E & a 1.0 P/S! But the trouble with this sector, it’s totally boom-and-bust! I clearly need to study up more – so far I haven’t really figured out the cycle here. Then again, I’m not sure who has!? Because I see constantly changing (& completely wrong) estimates of demand (& supply), both at the analyst & the industry level. This is compounded by the nature of the key input costs – you’re essentially investing in a mining industry, that’s also v heavily dependent on energy! Put all this together, and it’s difficult to assume fertilizers are such a smooth & easy bet on agriculture. I also consider their portfolio allocation absurdly high, particularly in light of what’s missing elsewhere in the portfolio. Equipment (15%): Deere & Kubota. Let’s just focus on Deere: They boast of being global, but 74% of their sales are in W Europe & N America. Yes, that’s the W Europe which has, on average, the highest farmland prices in the world. And the US is rapidly catching up – in fact, it has all the makings of another glorious bubble, with $15 K+ an acre price reports now coming out of Iowa. Yes, farms in these parts of the world are highly productive, but that means they’re also heavily dependent on capital, fertilizers & irrigation. Not to mention out-sized subsidies from financially stressed governments. That presents a potentially v fragile situation. In addition, farm equipment expenditure’s actually quite vulnerable to the general economic climate – the fact that the majority of this capex funding must come from the banking industry, directly or indirectly, dictates that. This all presents some potentially alarming revenue risks for Deere & other big-name farm equipment providers. I really struggle to see the agricultural exposure here – these guys might as well be processing widgets. In fact, if they were in the widget processing business, I’d really expect v little difference in their business model(s), prospects, and/or their stock-market ratings! Plantations (7%): Wilmar, a palm-oil plantation owner & refiner, which owns/manages over 700,000 acres of plantations. Unfortunately, if stock research isn’t your cup of tea, ETFs may be the only solution. Or maybe I’ve scared you off completely?! But every fund’s different, new funds are being launched constantly, and prices & markets change, sometimes rapidly. An ETF may prove better than nothing, but please pay v close attention to all the cons/pitfalls I’ve written about here. At the v least, before buying any ETF, understand exactly what type of fund it is, how it’s structured, and then look a little more closely at (even) its Top 5 holdings on Bloomberg, and on their individual websites. Who knows, a particular stock may just jump out at you as a better buy – there’s no such thing as plagiarism in investing! Of course, more comprehensive research & the buying of individual stocks is always going to be the ultimate & best solution. I’m confident there’s plenty of stocks globally that offer the right kind of exposure, and sometimes they even offer the right price also! 😉 I’ve written about some of these on the blog before, and hope to introduce some new ones in the future. And PS: The agriculture section here is another wonderful place to look for ideas. Good luck! Hi Wexboy. Any further thoughts please? As I am bearish on bonds and equities, I am increasingly searching the world for investment ideas with a low correlation to other asset classes, as well as a long term inflation play. Aswell as TLI, CAT, SIGG etc I have been looking at WEAT and other grain ETFs but come across the same concerns you have about contango. I don’t want to buy Monsanto etc. I really want to get exposure to the next spike in wheat (or corn etc) prices even if that happens in several years but the natural drag on ETFs is a major disuader. I had some success before in capital protected products but again the contango limited the upside and the counterparty risk puts me off now. I could simply buy the futures but I dont want to go down this route. They’re not that transparent, but litigation funders may provide an interesting uncorrelated (even slightly negatively correlated) investment. Exposure to distressed companies/assets provides good diversification also, and might be shaping up to be a multi-year investment opportunity in Europe. In fact, exposure to distressed consumers is great too & I believe it’s actually a permanently attractive investment opportunity. Some opps in the UK, and plenty in the US, but listed opps. in Europe are frustratingly almost non-existent. With agri, there may be temporary supply/demand issues, but they tend to resolve themselves. As a longer-term investment/inflation play, I don’t think there’s any great hurry right now to load up, as I’ve mentioned before. Great detail and analysis .. My only experience of agricultural stocks was wiseman dairies . Which I bought at what I thought was a reasonably cheap price .. They got squeezed badly when a milk discounting policy was adopted by uk multiples .. A fortunate takeover from Muller rescued me somewhat .. Maybe an investment in the supermarket multiples mite be worth considering as an exposure to food agriculture ..or so the farmers would have us believe. The Western dairy model really doesn’t include production any longer. They’re purely processors, which tends to limit their prospects & attraction. As I highlighted above, I don’t believe they provide much genuine agri exposure – the same is even more true for supermarkets, in fact they’re really ‘second-derivative’ processors! far more noticeable/significant, and iv) much of their distribution occurs via large supermarket chains these days. And all this is exacerbated in the UK..! Shame – Wiseman & other dairy cos in the past number of years were cheap, actually quite well-run, and were focused on consolidation/rationalization. But that’s just like playing the hand you were dealt – all makes sense, but doesn’t mean you’re going to win! That’s why I could never be persuaded to invest. Enjoyed it. Entertaining as always! Sheer bliss indeed.. though I suspect I’d feel like a fish out of water trying to figure out whether a commodity is fairly priced or not! Thanks, Lewis! Funnily enough, I recall a trading futures ad clip that basically made that pitch! Well, minus the sarcasm. Pretty sleazy! Sounds just like Lind-Waldock, who somehow managed to remain vaguely reputable despite sucking in countless numbers of clueless investors who’d promptly blow themselves up..! Yes, I was being kind describing Western agriculture as ‘v fragile’. Re the UK, I agree – considering UK farmland values, and some other UK-specific factors, I’ve v little interest in that kind of exposure. I’m happy with the idea of UK-listed, not UK-exposed, agri stocks..!